Tacko Fall is still learning basketball and learning his body. But the 7'6" UCF center knows well enough what he means to his team and the people who gaze up at him everywhere he goes, including at UCF's first NCAA tournament since 2005. 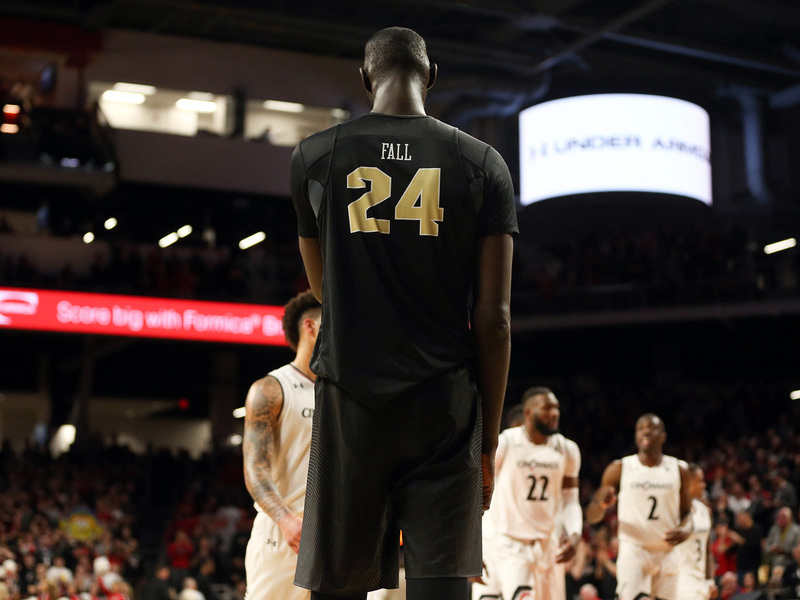 ORLANDO, Fla. — The clock ran out on his last home game on campus, and Tacko Fall found himself swarmed at half-court by fans and friends. March Madness was coming, and UCF was going for the first time in 14 years. He bounced along, a grinning giant amid a sea of black and gold and waving cell phones. He then found his way through the crowd, into a vacant corridor, and he broke down. This was the first time his mom had ever seen him play in person. He pulled his jersey over his head, crumpled over at his waist, and let the tears go. Assistant coach Vince Taylor reached up to console him as he covered his face. Then, suddenly, he was composed again: back in the throng, lifting up his younger brother in celebration. At one point he realized he had dropped his jersey. He looked frantically, but it was no use. Someone had swiped it. 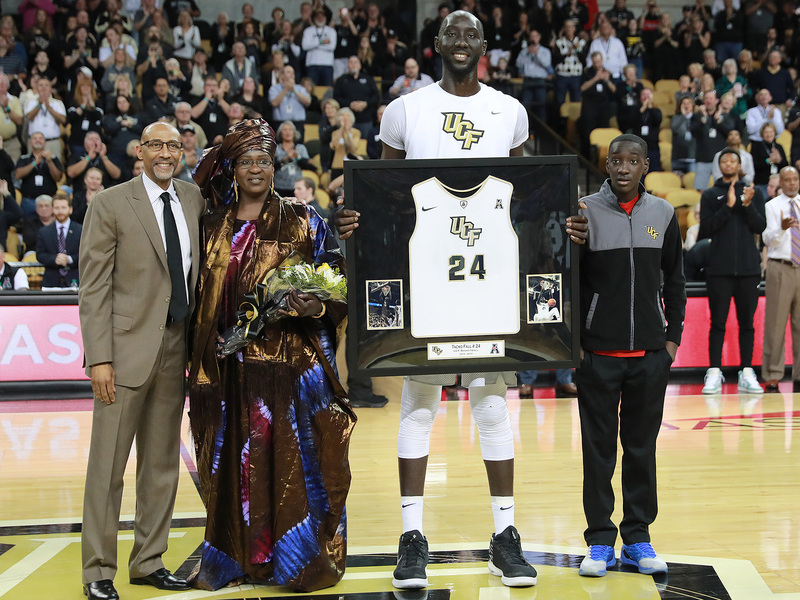 Since he arrived in this country from Senegal seven years ago, leaving his family and everything he knew, Tacko Fall has tried every day to give a little bit of himself. And every day someone has wanted a little bit of Tacko. He is, after all, so rare and precious: a 7'6" man in a world where 6'6" people stand out. Who wouldn’t want a selfie, an autograph, some souvenir from one of the tallest people on the planet? Even Mo Bamba, an NBA first-round draft pick who has become good friends with Fall, remembers cherishing an Instagram photo with him from years ago. “I knew of him for a while,” Bamba says. Fall has fought every day to fit into a smaller man’s world, ducking into showers and curling into Zipcars and lining up queen mattresses length-wise in his apartment. A smaller man’s world has tried to cut him down, whether through the difficulty of shopping for clothes or the frustration of opposing coaches who say, “Go for his knees.” Fall somehow stays above it all. Can Fall force a game to bend to his will? That’s the major question in March, and beyond. Will an NBA where seven-footers defend and shoot at the perimeter make room for an old-school center? A generation ago, Tacko Fall would have been touted as a budding Ralph Sampson, who was a 7'4" three-time AP Player of the Year and first overall pick in the draft. Now, in the KD and Giannis era, Fall may not even get drafted. “I feel I can impact the game like nobody else,” he says. How much can Tacko give? How much can Tacko take? 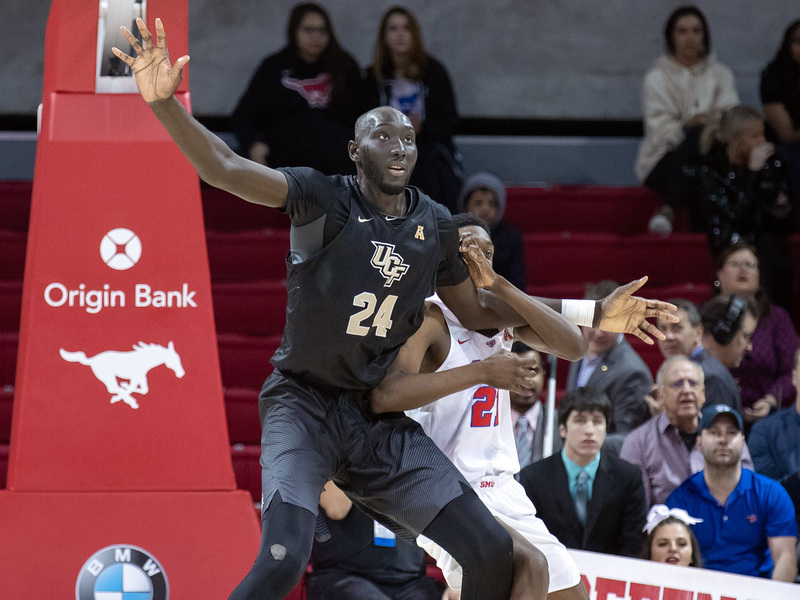 The road to Orlando for Elhadji Tacko Sereigne Diop Fall was long and fraught. He was discovered in Dakar by a brother of former NBA player Mamadou N’Diaye, and he was recruited to play in Texas at a charter school at age 16. That school closed, and Fall, already homesick, was left without paperwork to stay in the U.S. He went to Ohio, where his father and younger brother had emigrated, and then Georgia and Tennessee—basically a nomad who spoke French better than English and understood soccer better than basketball. Finally a p.r. executive in Tavares, Fla., named Mandy Wettstein heard about Fall and opened her home to him and another boy from Senegal. That was not yet the happy ending they hoped. Wettstein had to scramble to get Fall and his friend the right I-20 form; otherwise, they’d be sent back to Senegal. Every day was scary for that reason. Then there was the adjustment: Fall was a Muslim at a tiny Christian school, with 15 kids in his class. He had never owned a pair of dress shoes; for his entire childhood he had to restore and repair one too-small pair of sandals. The younger kids at Liberty Christian adored him, and he loved them back. Fall hid any fear and frustration well, offering a smile and high-five to any second-grader who yelled “Tackooooo!” in the hallways. Daily life would have been enough of a challenge for someone so new to this country, but Fall was on a steep basketball learning curve, too. At UCF, there would be so many more eyes on him. Even though it wasn’t a huge hoops school, a lot of people knew who he was when he arrived. “It was difficult only when I was about to be late,” he says. “I don’t like to be late. So when I have to be somewhere and people will stop me, I had to say, ‘I have to go.’ It’s very hard for me to say no. Especially at UCF, it’s the fans, and you want them to come to the games. It was really hard. But I had priorities. I had to get to class. So, ‘Next time.’” He smiles at this, but he looks as if he wishes he could stop for everyone. Wettstein even made Tacko a T-shirt that had the answers to all the usual questions: I am 7'4". I play basketball. I am from Senegal. Tacko reluctantly wore the shirt in public. People still came up and asked the same questions. “That was the end of that bright idea,” she says. People would just throw an arm around Tacko, or snap a photo as he stood in line. “If he stops for one person,” Wettstein says, “the crowd is gonna come.” The two of them had an agreement that he would give her a signal if people were too invasive. Then she would jump in and be the bad cop. In that final home game, against Cincinnati, Fall’s arm was grabbed from behind and he moved to free himself. The ref saw what he thought was an elbow and blew the whistle—even though Fall’s elbow is at eye level with most opponents’ foreheads. The UCF staff has made a habit of sending videos to the American Athletic Conference offices, but that won’t be an option during March Madness. Officiating crews from elsewhere in the nation won’t be familiar with how Fall plays. And you best believe every opponent will go to great lengths to get him into foul trouble. “Know your value” is something Dawkins tells him, which means don’t get baited into bad choices. But where’s the line? How does Fall dominate and still stay somewhat delicate? That dilemma is made tougher by the fact that he only started playing hoops as a teenager. He’s still learning the game and learning his body. And that’s the other puzzle piece: Tacko is 300 pounds. One NBA scouting site said he “lacks a high level of lateral quickness to move in space or a strong frame to carve out space around the rim,” and those two things are not easy to combine when you’re both skinny and one of the heaviest players in the sport. Pretty much any other player can just get into the gym and dive into weights and band work. Tacko requires something more refined: He can’t do deadlifts because it will put too much pressure on his back, and he needs a cushion to do squats, lest he sink too low before popping back up. To watch Tacko in warmups is to envy him. He can dunk almost without leaving the ground. He palms the basketball as if it’s a tangerine. Almost any fan would see him and think, “It’s so easy for him!” But truly it’s just the opposite. It’s uniquely hard for him: running the court, getting the abuse in the paint, keeping his wind, twisting and turning like a smaller player, applying force like a giant. It’s a testament to Fall that he’s so accomplished with so relatively little experience. He even lost a chunk of his junior season to a torn labrum. Yet he might be peaking as he enters the postseason: He’s had double-doubles in two of his last five games, including a 23-point, 20-rebound game against SMU. Justin Zormelo adds to that sentiment. He is a Miami-based analytics expert who trained Kevin Durant, and he has worked with Fall for the majority of his college career. Zormelo thinks Fall breaks the mold and warrants his own category. Pre-draft camp will be crucial. Fall will either entice or repel, based on his play and the imagination of those watching. As with everything, it’s kind of up to him and kind of not. As always, Fall has bigger things in mind. He wants to be an ambassador for the sport in his home continent. The NBA is starting a league in Africa, and Fall would be a perfect liaison whenever his career is over. When his mother visited Florida for the first time early in March, she wore a gorgeous Senegalese robe, called a boubou, to the game. Fall wants to wear one on the night of the draft. If he does, it would be a special moment for an untold number of African children, boys and girls. And unlike the Senior Night jersey, the boubou is something no one can swipe from him. When life gets a little too intense, Fall has what he calls “the bubble.” “I get in my room, I don’t talk to anybody,” he says. “I sit down, no TV, nothing. I sit down and I think, think, constantly think until I feel like I’m O.K. Then I put it behind, in my past, and move on. More and more, he’s learned to communicate with friends, including Bamba, who is further along basketball-wise but three years younger. The two are close. He also has an expansive mind: He knows several languages, he minors in psychology, and he loves astronomy. He says his next big purchase will be a telescope. Only he would see how small he is, in a world where he’s anything but. That’s Tacko, though. He’s taller, older, wiser. He looks down on no one even though he can look down on anyone. And when he gazes at the stars, or at the world around him, he sees things most college students can’t. Because even with all the obstacles, when he looks out at his own horizon there is nothing in his way.